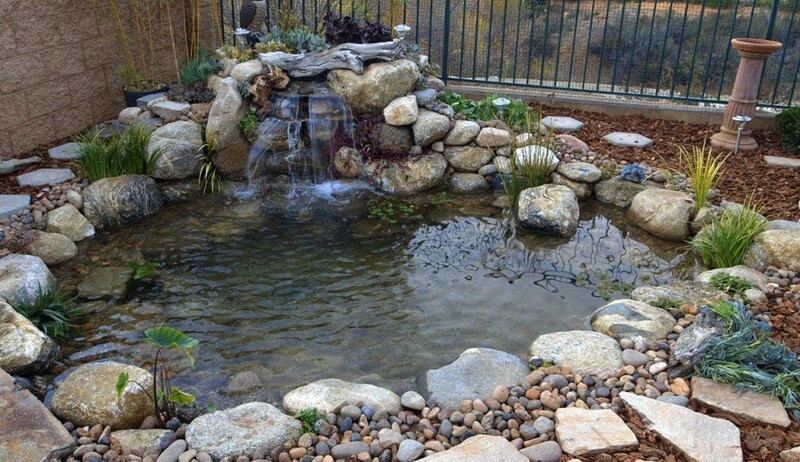 Backyard ponds can be easy to plan and excavate, and – with a little imagination – they can be made to look like a natural feature of a landscape. The only additional material you may need for a basic design, aside from a shovel, water, and some muscle power, is a pre-formed or flexible liner and a pump, if you plan on adding a fountain effect. Begin by choosing a site that makes sense in terms of the overall layout of your landscape. Are there areas where water naturally collects after a rain shower? Digging your pond in such a place can solve poor soil drainage problems while at the same time alleviating your need to manually fill your pond as often – or at all. You can even utilize rainwater by channeling it from your roof gutters down the spout and into a low-lying part of your yard where you’ve dug your pond, thus keeping it naturally filled throughout much of the year. Consider also the presence of trees in the area. Falling leaves can be a boon to a mini ecosystem if you plan on utilizing your pond as a habitat for amphibians. But they can be nuisances if you’re envisioning, instead, a pristine and quiet water garden. Finally, make sure that you aren’t planning on digging over any water or power lines. Once you’ve chosen a location, plan the dimensions of your intended pond. A good rule of thumb is to make your length double your width, and your depth equal to your width. So six feet by three feet by three feet, for example, is a good working model. A natural shape, as opposed to a perfect circle or oval, will make our pond seem more a part of the surrounding landscape. If you plan on adding water plants, you can create foot-wide terraces at different depths as you dig down. These dirt shelves will give you convenient spaces to place plants of different sizes. Of course, if you use a pre-formed liner then the internal contours of your pond will already be decided for you. A flexible liner, on the other hand, will lend you more freedom to be creative. In either case, make the banks gently sloping rather than steep, and insure that the rim is level all around. If you plan on introducing fish or other wildlife, make sure that you choose a liner that won’t release toxic materials into the water. Liners made from PVC or propylene will be safe for fish. Most gardening and landscaping stores will give you a few options, and you can also order your liner online. Before you fit it, pad your hole with some newspaper (it’ll set better if it’s damp) to give it some added protection. For even better results, use a geotextile pad. This will serve as a buffer between your liner and any sharp rocks or roots. Make sure the soil is well tamped down. Then use the dirt that you removed whilst digging, and cover your liner with a layer of it (about five or six inches deep). This will protect it from damage by the sun’s ultraviolet rays. After filling your pond, let the water sit for at least a couple days before you add any plants or wildlife. Pet supply stores carry conditioner specifically designed to make water safe for fish. At this stage, you can really make your pond your work of art, and sculpt it with (preferably native) plants and whatever decorative additions you may want to use. If you need excavating services for you backyard pond, CJD Constructions is ready to help. Click here to learn more about our excavating and trucking or request service today!